The story of Academy Square has all the makings of an epic: a great lady in distress, heroic rescue attempts, disappointment, hope, redemption. It is the story of a dream that refused to die. Now the Academy Building is emerging from all the years of dark uncertainty as strong and splendid as it was when completed in 1892, its graceful towers drawing our eyes skyward and our hearts to the past. Among the luminaries echoing through its history are student Philo T. Farnsworth, BYH '24; and teachers B. F. Larsen, BYU '12; John M. Hafen, BYU '08; Gerrit de Jong, BYU '25; and T. Earl Pardoe, BYU '25, and Kathryn Pardoe, BYU '34. Karl G. Maeser envisioned its design based on a visit from the deceased Brigham Young. The prophet's son, Joseph Don Carlos Young, was its architect. Newer names have also earned honored inclusion in the history of Academy Square. Paxman, Raynor, and Harrison are three. These stalwarts kept the dream alive for the 19-plus discouraging years after the sale of lower campus in 1975. The property would change hands nine times, plans for it coming into focus, then fading: retail shops, offices, restaurants, museums, theaters, a gymnasium, a movie studio, housing, and centers for research, rehabilitation, entrepreneurialism, service, and the arts. "We grieved about it being sold. I wrote lots of letters," remembers Shirley Brockbank Paxman, '68. "And when the lawn and trees were dying, my husband, Monroe, repaired the sprinkling system and we paid the water bill. For 25 years I've worked with every mayor and developer." Wallace A. Raynor, '57, also spent those years safeguarding Academy Square, advertising its potential, working to establish a trust fund toward purchase, taking up his flashlight and patrolling against vandals. Once when demolition threatened, he vowed to stop the bulldozers by chaining himself to the fence. Betty F. Harrison, '59, pulled nearly $80,000 out of her retirement funds to finance a community service center, and her partners, Mary Gay Hatch, '56, Valerie Kelson, and Dan Losee, also spent thousands. Their creativity in recruiting volunteers was remarkable, but the historic easement to protect the four buildings' exteriors prevented them -- like all the others before them -- from developing an affordable venture. Still, no truer champions could have protected BYU's birthplace. 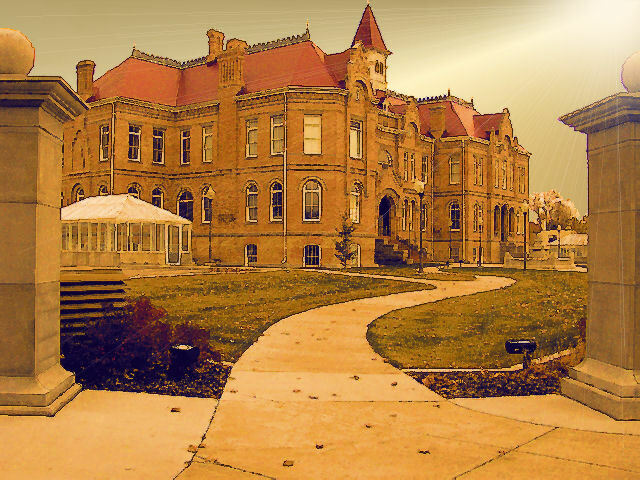 Because of them the venerable buildings were still standing when Provo City bought Academy Square in March 1994. Within weeks, believing that the square's dilapidation and liability now superseded its historic easement, the city announced that Georgetown Development was preparing to replace the old buildings with condominiums. 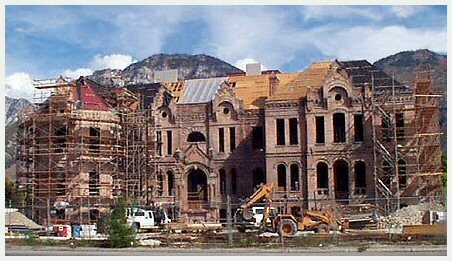 To block demolition, that July the Utah Heritage Foundation (UHF) sued Provo City. Provo contested the suit. In November, responding to police and firemen's concerns about asbestos, hantavirus, and structural hazards, Provo's board of appeals ruled that the buildings were dangerous and ordered city officials to improve security. The time had arrived for another name to make Academy Square history. Early in the year of 1995 Dr. L. Douglas Smoot, BYU '57, answered the call to lead the preservation efforts of the Brigham Young Academy Foundation (BYAF). The great-grandson of premier BYA benefactor Abraham O. Smoot, Doug had the experience, the fund-raising contacts, and the vision. As former dean of BYU's College of Engineering and Technology, he could be believed when he said the neglected buildings were still sound. Smoot and his colleagues first worked with the Provo Library Board and the city council to approve a $70,000 feasibility study, paid for by the BYAF and conducted by Max J. Smith Associates. The time was right. Library board chair Paul K. Sybrowsky, '68, and director Julie Farnsworth were looking for a new library site, and there began to be talk of relocating to Academy Square. In July 1995 Suzy Calder Liechty, BYH '57 and BYU '60, spearheaded a 2,200-signature ad in Provo's Daily Herald asking the mayor and city council to do "everything in their power to preserve the Academy." It was the closest thing to a public mandate so far. Not long afterward the court ruled that the UHF easement was indeed valid. As BYU Homecoming approached, Mayor George O. Stewart offered Academy Square tours to the alumni and public. Portions of floor and roof were collapsing. Brickwork was crumbling. Pigeons and bats shared space with transients and vandals. In one room someone had painted a pentagram on the floor. The old buildings were considered such a hazard that the fire department said it would let them burn rather than endanger firefighters. Bulldozers were in place and ready to roll when BYAF member V. Maurine Jones Brimhall, '35, went to Mayor Stewart's office unannounced and persuaded him to consider preservation if sufficient money could be raised against a near-term deadline. Wally Raynor wouldn't have to chain himself to the fence after all. That winter a project that for years had not had a "snowball's chance" began to snowball. When the Utah legislature convened in January 1996, the foundations were laid for a major gift from the state. By April fund-raising was gathering momentum, spurred on by major financial help pledged by the George S. and Dolores Dor� Eccles Foundation and The Church of Jesus Christ of Latter-day Saints [no tithing funds were used]. August found the BYAF and the city agreeing that only the Academy Building would be renovated -- paid for by privately raised funds -- with a bond funding an architecturally compatible addition behind it and underground parking around it. In late November the city council approved a $16.8 million bond election for February 1997, and UHF's Lisbeth L. Henning said it would cease its legal battle to save all four buildings. It was a defining moment. Voters would decide if a library that included what Henning called the "most significant unrestored building west of the Mississippi" was worth a property tax increase of $3 � 4 per month. The next five months were rife with controversy. The Daily Herald supported the bond via its front page and editorials while opposing sides fought it out in letters to the editor. Some feared the cost would exceed estimates. Some thought it selfish -- why waste money on an old building instead of helping the poor? Some feared BYU students would monopolize the library. Some thought BYU students should not even be allowed to vote on the issue. The pace picked up through January 1997. Janelle Brimhall Lysenko, BYH '55 and BYU '59, set up a table in BYU's Lee Library to help returning students register to vote, urging them to vote yes. L. Lee Bartlett, '56, who later became president of the BYAF, created the campaign slogan "Vote once. Win twice." Fervent groups on both sides took out full-page newspaper ads. BYU's first lady, its legendary football coach, and a Provo city librarian smiled from smaller ads. The night before the election, a family set up a honk-and-wave rally on University Avenue. On election day, Feb. 4, 1997, an unprecedented number of voters cast their ballots -- 6,583 for and 4,731 against. It was a giant victory -- one 22 years coming. There remained the matter of raising the rest of the $6.5 million before the June 30 deadline. "One more miracle to go!" cried the faithful. That same month the public phase of the fund-raising campaign kicked off, headed by Smoot. Stephen R. Covey, '76, and LaVell Edwards, '78, served as honorary cochairs. Individuals, foundations, and corporations donated generously, and the BY Academy Alumni Club was organized to inform potential donors, many from out-of-state. In April Julie Roper enlisted several businesses to craft an aquarium, where library patrons, especially children, could donate cash. The BYAF sold pictures, T-shirts, and stationery. At Provo's Community Church, artists performed a benefit concert of Crawford Gates' works with the noted composer in attendance. Janie Thompson, '43, and family and Ruth W. Melville, '60, also gave benefits. In May Janita Anderson got Robert Redford to sponsor a dinner and silent auction at Sundance hosted by Kurt R. Bestor, '93. The Historic Families Program solicited contributions from families whose ancestors figured prominently in Provo and Academy history. A women's club donated several hundred dollars. A widow sold a rare book and gave the proceeds. Roper and Michael D. Ross, '86, organized an annual 5K race. With two weeks left, corrected project costs lowered BYAF's required donation to $5.4 million. Also, the city council announced it would allow no-limit letters of credit, thereby enabling more people to contribute. Some had met the earlier $100,000 minimum by using their homes as collateral. One week before the deadline, a celebration featuring six bands, food, games, and prizes benefitted the academy. Six days before, a family offered to match last-minute donations up to $125,000. Statewide, businesses set up a Web page, radio ads, and toll-free numbers to receive donations. B.Y. High alums conducted a telephone campaign. Four days before, supporters marched from the Center Street library to Academy Square, imitating the march from downtown more than 100 years earlier to dedicate the Academy. A child collected money door to door. Three days before the deadline, retired judge J. Robert Bullock arranged to sell at a bargain some property the city had long wanted -- if Provo acted in time for him to donate $75,000 of the sale to the BYAF. A part-time resident wrote a $150,000 check over lunch. Last of all, a California foundation sent a letter of credit for $1 million that put the project over the top. It arrived via Federal Express the afternoon of June 30. In all, more than 2,000 donated. Now, four years later, Jacobsen Construction and 65 subcontractors have nearly completed their work. The Grand Old Dame of University Avenue has seen a lot of dreams come and go in her 109 years. She has sheltered a lot of dreamers, and a lot of dreamers have sheltered her. Come early summer this state-of-the-art library will be benefitting a whole new generation. Some dreams do live on . . . and on. Judy B. Garvin, BYU '63, is senior editor at BYU Publications and Graphics.